When it comes to skincare products in our house, it is what IS NOT in them that is so important to me! We only use products that are free of parabens, sulfates, and other harmful ingredients! When they are made with organic ingredients that is a major PLUS! The latest products in our shower and bath are Alphanova body care products that are made in Provence, France! My children will stay healthy and clean when using these certified organic and all natural skincare and hair care items straight from France. They know how delicate new skin is and don't want to compromise that in any way. That is why we they offer some of the best ingredients in their products made right at the source in Provence - France. The products are organic and eco-friendly. They are all Paraben FREE, Coloring Agent FREE, and Hypoallergenic! More than 99% of the ingredients in the bebe line are natural, and both lines are certified organic by Ecocert. These all natural and certified organic skin and hair care products would be perfect added to a baby shower gift basket, or to a mom-to-be survival kit. Buy them as a gift, or keep them for your own little ones! Two of my favorite Alphanova products are the Organic Moisturizing Milk for Atopic Skin and the Organic Dermocleansing Gel. I love the Organic Moisturizing Milk for Atopic Skin because my son has really sensitive skin and in the winter can get eczema and dry skin from the cold weather and water. 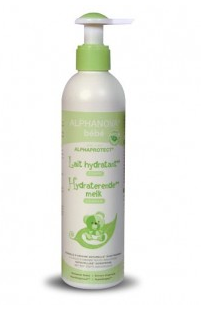 This Organic Moisturizing Milk for Atopic Skin is perfect to keep his cheeks baby skin soft! This bottle of certified organic moisturizing milk is for the treatment of eczema or atopic skin. If your little one suffers from rough or damaged skin, this is the lotion you need to use. It is hypoallergenic and tested under dermatologist supervision. The Organic Dermocleansing Gel is sitting in our shower for keeping my little boy clean and safe from harmful ingredients! It works great to clean off his dirt from playing outside all day and my husband also likes to use it to wash off grease - it works great! This 13.2 fl. oz. bottle of certified organic dermo-cleansing gel comes with its own pump for easy use. It is a natural soap-free foaming gel that is perfect for daily use. The tear-free formula means less tears at bath time! It is non-drying and can be used to wash hair and skin! When you use these Alphanova child and baby skin and hair care products, all you need worry about is if the water is the right temperature! Win It: BuyProvence.com is generously offering (1) Organic Moisturizing Milk for Atopic Skin to a lucky winner! I'm always worried that since I have sensitive skin, my baby could have sensitive skin too. So I try to use products like this.